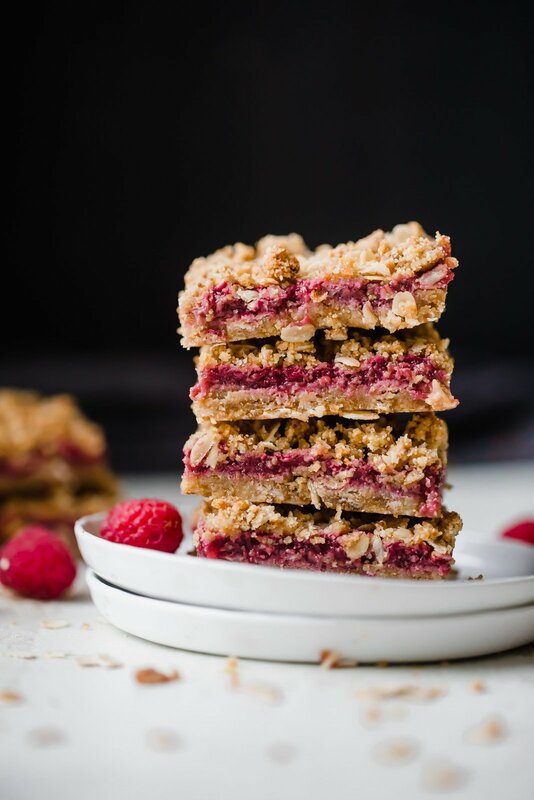 Healthy, gluten free fresh raspberry crumble bars made with a fresh raspberry jam. This healthy dessert is easy to make, and perfect for using up your summer raspberries! Over the past two weeks here in Chicago, it’s probably rained every other day. My plants are dying from being overwatered and it’s starting to feel more like Seattle. When it gets a little gloomy out, my baking mood is in full swing. Anyway I’m basically convinced to make your summer the most delicious one you’ve ever had. I’m covering all the basics on the blog this summer (bars, crumbles, jams, sauces, salads, bbq stuff, etc). And now we’re talkin’ bars baby. I tested these bars four times to get the crumble perfect and the inside just perfectly sweet enough. Finally, I got to a place where I felt like fresh raspberry jam is better than anything Smucker’s ever bottled up. 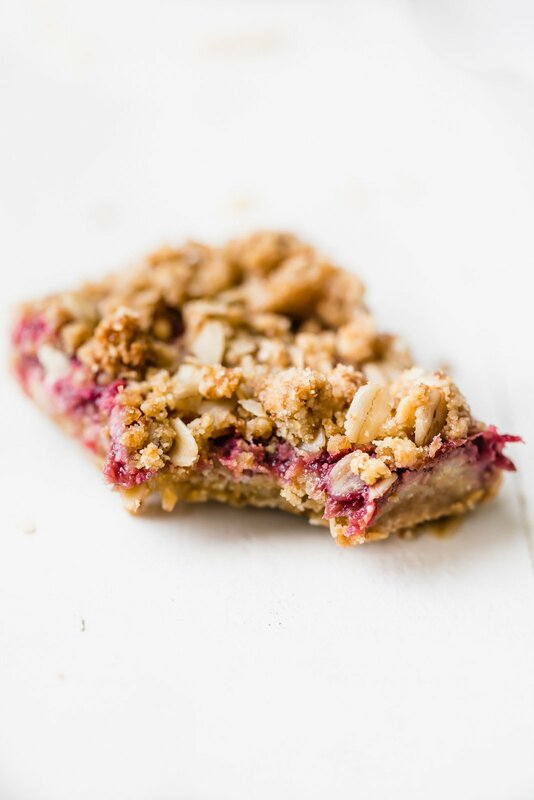 These lovely little crumble bars are made with wholesome gluten free ingredients, making them a perfect bar to bring to any party. The base + topping is made with coconut oil, almond flour, coconut flour and coconut sugar. And the filling is SO simple, yet so GOOD: raspberries, honey, vanilla tapioca flour (or arrowroot), and a pinch of salt. To me, they taste like a Nutri-grain bar (remember those?). I think you’re going to LOVE them as an afternoon snack with a cup of coffee or a glass of almond milk. And they best part? They’re made with amazing ingredients to help fuel your body. Enjoy! I hope you love these bars as much as I did. 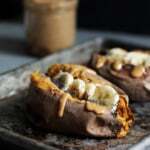 If you make this recipe, be sure to tag #ambitiouskitchen on Instagram or leave a comment and rate the recipe below to let us know how you liked them. xo! 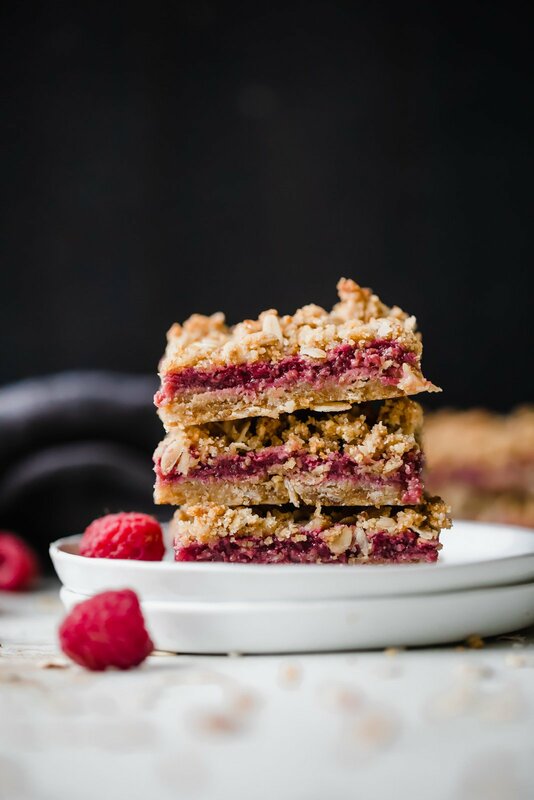 Healthy, gluten free fresh raspberry crumble bars made with a fresh raspberry jam. Easy to make, and perfect for using up your summer berries. Preheat oven to 350 degrees F. Line an 8x8 inch pan with parchment paper and generously spray with nonstick cooking spray. Set aside. Make the base + topping: In a large bowl, mix together egg and coconut sugar until well combined. Stir in almond flour, oats, coconut flour, cinnamon and salt until well combined. Pour coconut oil all over and use a fork to evenly distribute and stir together until clumps begin to form and resemble a wet sand look. 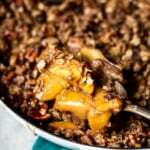 Place 1 ¾ cup of mixture into prepared pan (the remaining mixture will be used for the topping). Use your hands to evenly press dough to the bottom. Place the remaining dough for the topping in the fridge. Place a medium pot over medium heat. Add in raspberries, honey, vanilla, tapioca flour and salt. Use a wooden spoon to press down and break apart the raspberries. Bring to a boil, then reduce heat and cook for 2-3 more minutes until mixture is thickened up a bit and no large raspberry pieces remain. 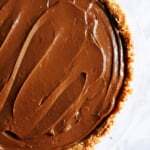 Pour mixture over the crust and use a spoon to evenly spread. 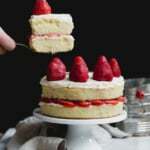 Sprinkle the remaining topping evenly over the raspberry filling. Bake for 25-30 minutes or until filling is bubbly and topping is golden. Allow bars to cool completely on a wire rack before transferring to the fridge to chill. Bars are delicious served at room temperature or straight out of the fridge. Use a sharp knife to cut into 12 bars before serving. Feel free to use blueberries or strawberries instead of raspberries. To make the bars grain free, feel free to leave out the oats. 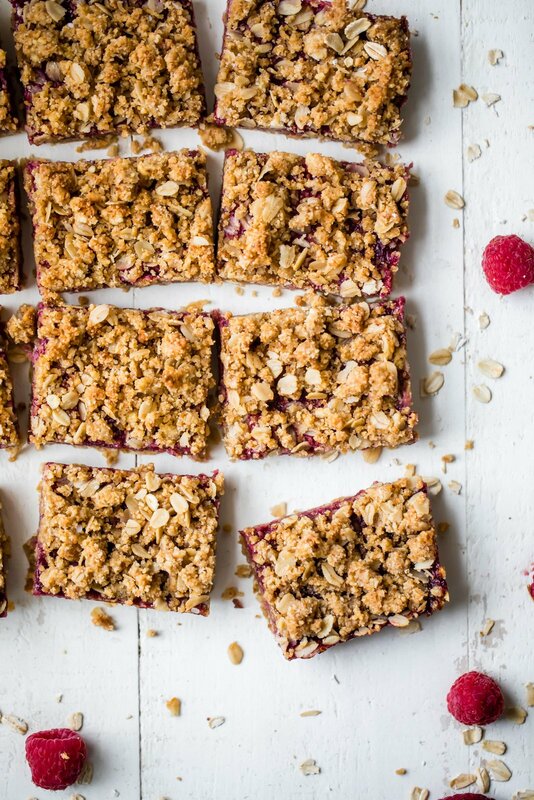 41 Responses to "Raspberry Crumble Bars"
These are perfect for summer! I’ve yet to make a fruit dessert this summer…these are first on the list! I love how they don’t have a ton of sweetness…perfect to let the raspberry flavor shine through! Updated: 2 cups almond flour! It’s 2 cups — sorry about that! Wondering how much almond flour to use! Any ideas if regular flour would work with the same end result, and if so, how much to use? Thanks! I wouldn’t recommend regular flour because the texture will change. You could try hazelnut or cashew flour in place of the almond flour! YUM! That filling sounds so delicious!! Perfect summer desert to bring to any occasion! Or just to make for myself hahaha! Hi! The ingredients only state coconut flour but the method indicates both almond and coconut flour. Should there be some almond flour too? Thanks! Vibrant and healthy beauty again :-: Thank you so much ! I am completely on board with grabbing all the goodies at Trader Joe’s and then coming home to make these DELICIOUS bars! Ooh, so good. Maybe I’ll have to add some rhubarb too just for fun. YES can’t stop won’t stop! Rhubarb would be delicious in here! 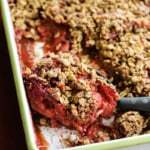 I am a SUCKER for crumbles! These bars look like the perfect treat for any picnic or summer party. Then again, I could just make them at home and gobble them all up for myself, haha! 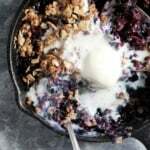 Would this recipe work with other berries–blueberries, strawberries, blackberries, etc.? Me too!! They’re the best. And I think they’d be delicious with other berries! Can you use whole wheat pastry flour instead? These look amazing! Do the bars freeze well? They’re delicious! I wouldn’t recommend freezing them (the “crumble” won’t be very crumbly anymore). These look delicious. I am sure they are equally enjoyable both as a snack or for breakfast. Thank you for sharing this Monique. Any suggestions for sub for the coconut flour? Wanting to make right NOW but have everything but that. 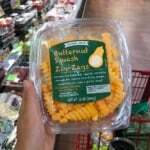 I have the almond flour but is there a substitute for the coconut flour? Made with changes. I didn’t have the almond flour or coconut flour (used 1.5 cups of AP flour instead). Used maple syrup instead of coconut sugar and frozen blackberries (strained after cooking) instead of raspberries. Haha. True story. All else I followed as directed using the cornstarch option in the fruit. I realize I made some serious changes but figured if anyone else is curious what would happen if… they would really freaking good. Thanks for the healthier crumble recipe. Glad those swaps worked out too!